UrlEcho and UrlReq are two HTTP services I built a few years ago when I started learning about the Web’s architecture. The services are fairly generic and might be useful to other people experimenting, testing and debugging Web-based systems. They are hosted on AppEngine and free to use. Both services receive an HTTP request which contains a definition of another HTTP message in the URL of the received request, and then do something with that message. where the strings for header names and values, and for the body must be URL encoded. 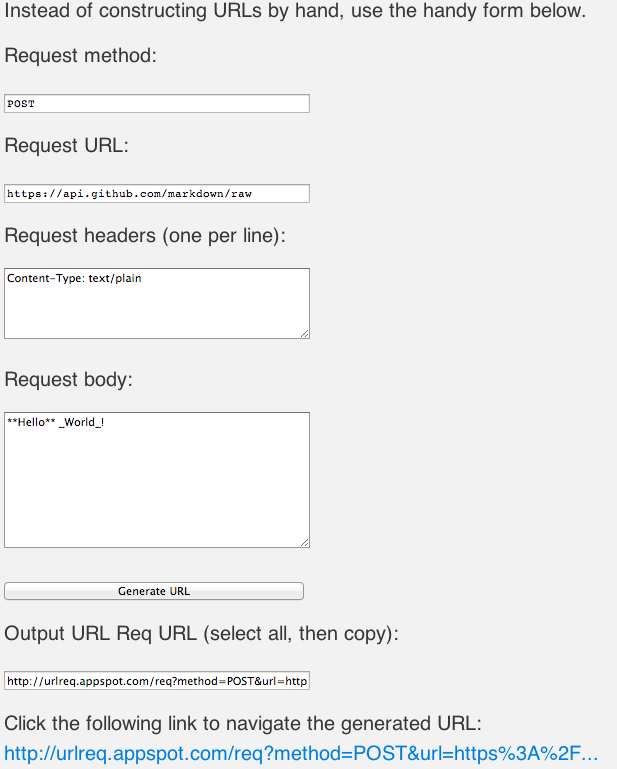 where the strings for header names and values, for the target URL, and for the body must be URL encoded. To make the construction of such URLs easier, simple URL builder forms are available for both services: UrlEcho URL builder and UrlReq URL builder (scroll down when you get to the project page). Also, both services have support for debug mode by appending &debugMode=1 to the end of the URLs. When in debug mode, the services return a text/plain version of the HTTP response that would be returned if the service was not in debug mode. So, it’s basically a text log output of the intended HTTP response. In a way, both services change/break the default way of using HTTP – the URL is used for more than identifying a resource and the services are just stateless shells that either echo requests or responses. They could be thought of a special kind of HTTP intermediaries. UrlEcho permits the requestor to completely define the response it wants to receive, thus giving it the ability to “host” static HTTP resources within URLs themselves. Why is this cool/useful? You don’t need a Web server to host a simple resource – you just construct a URL and you’re set to go. Since resources are cheap to create and throw away, you can create as many URLs as you want, when you want them. UrlEcho lets the requestor to wrap any HTTP request (any method, with headers and body) into a simple GET request with only an URL defined. Why is this cool/useful? You can make any HTTP request in situations where only a simple GET is possible, or where you can only define just the URL. For example, most systems that provide Web hook callbacks only let you define the callback URL only (not the method, headers or body structure). In general, the reasons behind using URLs to “host” HTTP messages (versus choosing headers or the body) is that it has the widest possible applicability. The URL is often the only thing you can define for a request – e.g. in <a> and <iframe> HTML elements, and when defining Web hook callbacks. You can’t set HTTP headers or the body in such situations, the URL is all you have access to. The example I gave above for UrlReq, the one for rendering Markdown text to HTML using GitHub’s API – isn’t it cool how you can give a simple link to someone, that makes a POST request behind the scenes? It is. Note also that the services don’t respond just to HTTP GET requests, but also to HEAD, POST, PUT, DELETE and OPTIONS requests. This means that, for example, you can make an HTTP DELETE request to UrlReq and make it do an HTTP POST or HTTP PUT request in the background, just by playing with the URL. The main issue with using URLs for passing data is that URLs have limited length. You just can’t put 10 MB in there. Long, ugly URLs make you go Meh.? Just use an URL shortening service on the long URL, like so: http://goo.gl/UOQPy. More information about UrlEcho and UrlReq is available on their Web sites. Let me know if you like the services, think they’re an abomination of the Web, or have any other cool ideas for HTTP services. As for me, I really learned to appreciate nice and simple HTTP services with generic applicability. There is a nice list of other such services in my blog post The Web Engineer’s online toolbox.